There's newly surfacing footage of the alleged missing American journalist Jamal Khashoggi, as President Trump says he's spoken to Saudi Arabia about the “very bad situation” occurring. Photos have surfaced of an alleged 15-member “assassination squad” sent to stalk the journalist, Jamal Khashoggi, who has been missing since entering the Saudi Consulate. As of this time, the Saudi Total Family has repeatedly denied any knowledge of such a coordinated attack. Reports have also suggested that the Journalist was killed by a “Saudi Hit Squad,” with some suggesting that it happened in Turkey. "We cannot let this happen — to reporters, to anybody,” Trump told reporters during a briefing in the Oval Office. Both National Security Adviser John Bolton and Senior White House Adviser Jared Kushner spoke to the Saudi Crown Prince Mohammad bin Salman via phone conference, expressing their interest in any information on Khashoggi. Khashoggi's fiancée, Hatice Cengiz, penned an Op-Ed pleading with the White House, and FLOTUS Melania Trump, to pressure the Saudi Crown for answers of what happened to her husband. 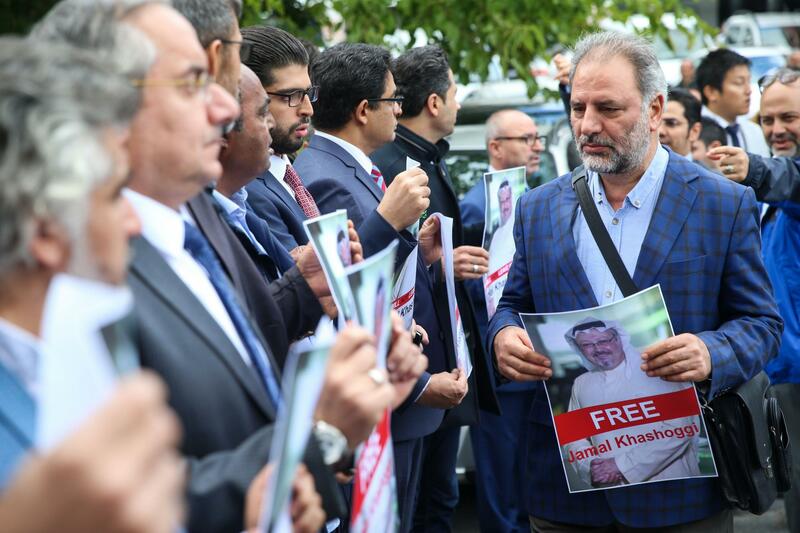 "I implore President Trump and first lady Melania Trump to help shed light on Jamal’s disappearance," Hatice Cengiz wrote in<a href="https://www.washingtonpost.com/news/global-opinions/wp/2018/10/09/please-president-trump-shed-light-on-my-fiances-disappearance/?utm_term=.5acca27b1f60"> The Washington Post, </a>the Jeff Bezos and CIA conflicted newspaper where her lover contributed. "Yet he noted that there was no warrant for his arrest in his native country," she wrote. "Although his opinions had angered certain people, he said, the tensions between himself and Saudi Arabia did not amount to hate, grudges or threats." "Although my hope slowly fades away each passing day, I remain confident that Jamal is still alive," Cengiz wrote in her piece Tuesday. "As an individual who believes that life and death are in the hands of God, I pray to God alone for Jamal’s safe return." Khashoggi was last seen entering the Consulate via Istanbul last Tuesday, after having been critical of the Saudi Crown in repeated articles in the past. The Kingdom of Saudi Arabia has long-since held a reputation of brutal tyranny and oppressive tactics against journalists and reporters. It's also a nation that President Trump condemned heavily on the campaign trail as having involvement in the September 11th, 2001 attacks. As President, Trump visited the Kingdom of Saudi Arabia and negotiated a historic arms deal, contrary to that same rhetoric. The President has ramped up his rhetoric against the Saudis again in recent weeks, saying the Saudi King wouldn't last two weeks without the United States of America. The tone has further raised hopes that Trump will denounce the Kingdom for their brutal human rights violations. While Khashoggi remains a mystery, there are no doubt investigations occurring from the United States of America's intelligence community, seeking answers to what really happened. Saudi Crown Prince Mohammed bin Salman<a href="https://thehill.com/blogs/blog-briefing-room/news/410202-saudi-crown-prince-invites-turkish-authorities-to-search"> told Bloomberg in an interview last Friday </a>that Saudi officials have "nothing to hide" and assented to a search of the consulate. We will update this story with any information as it arises. Trump also to Kanye West about solving the nation's problems, so that pretty much sums up how 'important' Trump's idiotic conversations are. The Kingdom of Saudi Arabia have absolutely NO respect for Trump, nor do they fear him in any way, shape or form. These days, nobody is afraid of America, thanks to Trump's stupidity and ineptitude. Courtney, at least you're finally learning to stop making your articles so long. When you make them so needlessly wordy, your readers lose interest. Glad I could help.